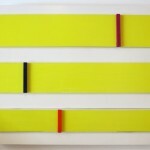 If there are tendencies that unite what is categorically understood as “Detroit art” in the late twentieth and early twenty-first centuries, the two- and three- dimensional paintings of David Rubello stand outside of them. If Detroit art is messy, Rubello’s is meticulous. 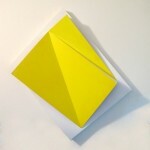 If Detroit art tends toward representation, Rubello’s insists on abstraction. If Detroit art is a reflexive interrogation of the postindustrial condition, Rubello’s formalist paintings exist in an idealized, apolitical, and ageographic universe of pure visuality, where form is content and content simply form. 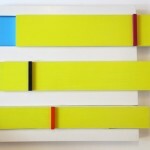 Yet Rubello is a Detroit artist, and by folding him into that category, the category itself becomes enlarged, becomes more clearly connected to aesthetic traditions, both classical and modern, that continue to inform art and design worldwide. 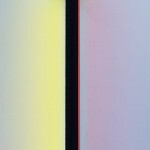 Since the late 1960s, he has experimented with line, shape, color, and perspective in an expansive, evolving body of work that retains an essential precision and verve even as it charts new territory in geometric abstraction, dimensionality, and interactivity. Rubello’s formal art education began in Detroit in the 1950s at Cass Technical High School and at the Detroit Society of Arts and Crafts (now the College for Creative Studies), where he studied under local luminaries Guy Palazzola and Sarkis Sarkisian. His post-secondary studies in Europe, meanwhile, had a powerful and lasting influence on his vision. As a figurative painter at the Academy of Fine Art in Rome in the late fifties and early sixties, Rubello encountered ancient, illusionistic experiments with perception and Renaissance innovations in perspective that would significantly inform his later, abstract works. After academic dabbling in nascent genres like pop art and action painting, Rubello turned decisively toward geometric abstraction under the tutelage of Richard Mortensen at the Royal Academy of Fine Arts in Copenhagen in the mid-sixties. 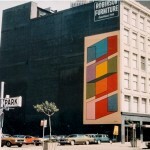 Rubello’s most well-known work, the iconic fifty-by-twenty- five-foot mural Color Cubes, painted on a downtown Detroit high-rise in 1973 and painted over in 2014, was representative of the idiosyncratic approach to geometric abstraction that he refined at the University of Michigan in the early seventies. 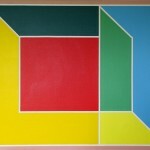 Like Color Cubes, his hard-edge acrylic paintings and screen prints of the time tend toward bold, saturated coloring and a deceptive, superficial clarity, but, upon closer examination, they engross the viewer in an illusionistic interplay between two- and three-dimensionality—see Room (1970). 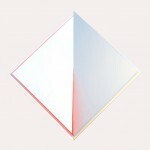 The result is a kind of pop “geometric surrealism,” to borrow a phrase from art historian Werner Spies. 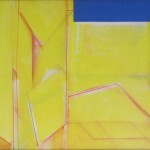 In the late seventies, after a return trip to Rome to continue his study of perspective, Rubello’s art took another decisive turn: Blue Cut (1978) was the first work he made with the idea that his paintings should “come out from the wall.” In that piece, he achieves this effect two-dimensionally, by juxtaposing two distinct, seemingly unrelated picture planes in the same work. 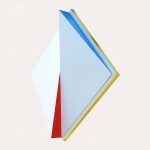 It is perhaps inevitable that just a few years later, Rubello would begin a now decades-long exploration of abstract work in three dimensions, typified by more recent pieces like Foyel (1999), Flag (2007), and Intruder (2010), sculptural paintings that escape the confines of two-dimensionality in order to literally share space with the viewer. Color Cubes. 1973 (painted over 2014). 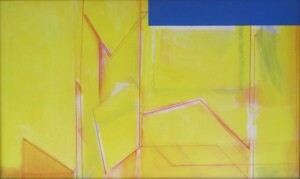 Mural, 50 x 25 ft. Image courtesy of the artist. Blue Cut. 1978. Acrylic on canvas, 36 x 55 in. Photography by Matthew Piper. Flag. 2007. Acrylic on wood, 34 x 34 x 3 in. Photography by Matthew Piper.